← Spring Study Abroad Fair! Co-organized by Temple University with Bryn Mawr College and the University of Pennsylvania Free tickets required for keynote lecture and symposium. Reserve online or call 215.278.7200. All events held in Comcast Auditorium at the Barnes Foundation. One of the least-studied neoclassical buildings in the Western Hemisphere, Haiti’s opulent Sans-Souci palace towers over the agricultural town of Milot. Construction began around 1806, a few years after Haitian independence, under Henry I, the Americas’ first black king. The massive structure, built to demonstrate Haiti’s importance on the world stage, has been the subject of much mythmaking and speculation. Using unpublished archival sources and a 2017 photographic survey, this lecture will examine the circumstances, influences, and builders of this extraordinary monument, showing its central position at the dawn of Caribbean and Latin American independence. 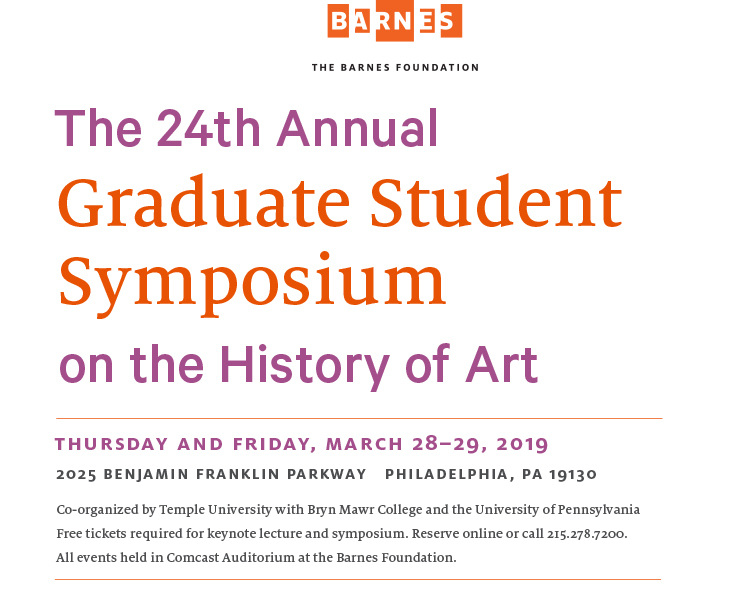 This symposium brings together graduate students from nine mid-Atlantic colleges and universities to present current research in the field of art history. Each session includes presentations followed by a moderated discussion.